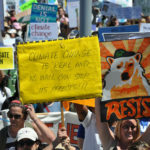 This climate summit, held in San Francisco next month from September 12 to 14, was the brainchild of Gov. Brown. It was conceived of in response to President Trump withdrawing the United States from the international Paris Climate Accord. World leaders will be in attendance to continue the work of past international climate conferences to mitigate climate change. 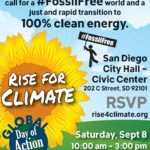 There will be numerous affiliate marches and rallies around the world (including San Diego’s Rise For Climate March) to demand a transformation to clean energy and real action on climate change. Gov. Brown and California get a lot of credit for climate change action and certainly market that reputation. The problem is this state and its government during Governor Brown’s reign neglected fossil fuel production as a target for climate change mitigation. Oil and gas production is declining in California, but not fast enough in light of the severity of the climate change threat. Nationwide, oil and gas extraction is increasing. California, with its accolades for leading the climate change fight in the U.S. is, in fact, a major contributor to that extraction. Production of fossil fuels is inconsistent with the state’s mandates to address climate change. On the one hand, state lawmakers are currently considering SB 100 which would move up the schedule of clean energy goals — since interim targets of SB 350 have been met ahead of schedule. On the other hand, California is a major producer of fossil fuels. The state needs to stop fossil fuel extraction to avoid the worst risks of climate change worldwide. The consensus of scientists is that fossil fuel reserves need to stay in the ground. According to the California Department of Conservation, there were 652 oil and gas wells stimulated using hydraulic fracturing in 2014. In 2015, California had 56,653 active oil and natural gas wells. In addition, there was a 17 percent expansion of offshore oil wells in California state waters under existing leases from 2012 to 2016.All this while the state suffers some of the worst health impacts of fossil fuel extraction and use. California is home to eight of 10 of the cities with the worst air quality in the nation. 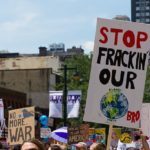 The poisoning of extreme amounts of water (a resource in short supply in this drought-ridden state) via the list of fracking chemicals used is also a hazard to health. The thin veneer of civilization will likely break down as food becomes scarce, infectious disease runs rampant and mass migrations of people — whose homelands will no longer support human life — spawn warfare and further destruction of the environment. Social and political structures in place are insufficient to deal with current levels of disruption. We already see waves of refugees in Europe and the U.S. reacting to degraded environments from prolonged drought and competition for resources. And we can expect more. Both the U.S. and Europe are struggling to process the numbers of asylum seekers. Xenophobia and backlash against migrants are escalating worldwide. What will happen when disruption is on the scale of a climatic apocalypse? We are an overpopulated speciesthat has outgrown the carrying capacity of the earth. Without our technology, mass communication and a worldwide distribution system of resources, we may revert to the savage. 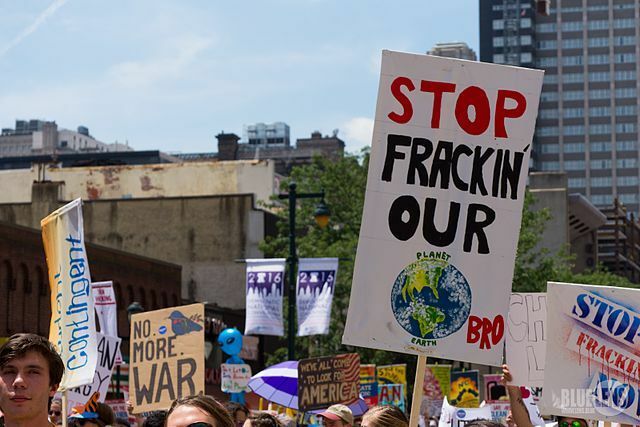 “Fossil fuel corporations are drowning our democracy in a tidal wave of dark oily money; they have deceived the public about the impacts of climate change, fought the growth of clean renewable energy, and corrupted our political system,” the resolution reads. Individual Democratic Party candidates are not required to follow suit, but the example is set. Now it is up to the people (us) to raise our voices to demand this same standard be upheld by candidates running for elected office and those already in elected office. There is no neutral position. To do nothing is aiding the perpetrators of climate destruction. Inaction means you are siding with the polluters who are sentencing all life on this planet to extreme suffering. Do something — and do it now! 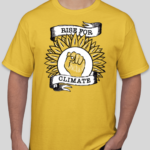 Join others who are willing to fight for climate justice and be part of the solution. The sacrifices we all must make will seem trivial if we are successful in saving our beautiful home and her inhabitants. Stephanie Corkran, MA, is an anthropologist who works in medical research at UCSD and a volunteer of SD350. She is a Coast Guard veteran who enforced environmental law and responded to oil and hazardous material spills, including the Exxon Valdez oil spill. She supports a vision of social justice that considers the needs of all life, human and non-human.